First Step In Health Exchange Enrollment: Train The Helpers : Shots - Health News Navigators are a key part of the health law rollout. They work at nonprofit organizations, and they're being trained to help people learn about their coverage options. In some areas that training is still going on, even though the exchanges are up and running. 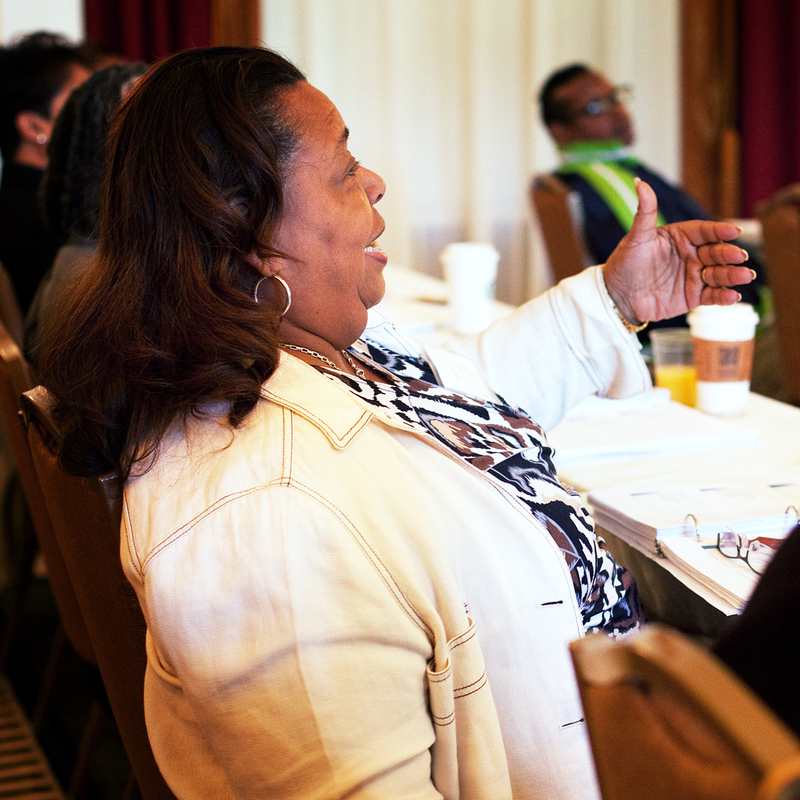 Assisters get up to speed on how best to explain the new health coverage choices during training on Sept. 25 at the Omni Shoreham Hotel in Washington, D.C. Even as the Affordable Care Act's new health exchanges open for business, polls show the public is still pretty confused about how they're supposed to work. The latest monthly tracking poll from the Kaiser Family Foundation, in fact, found that two-thirds of those without insurance said they don't have enough information about the law to know how it will affect them. A growing number of people want to change that. For the past several weeks, all around the nation, a small army has been preparing to help consumers sort through their insurance options, choose a plan and sign up. 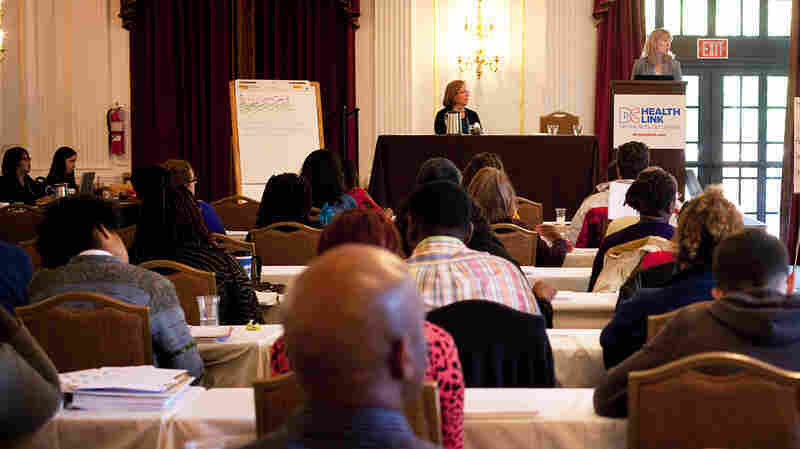 Last week in Washington, about 100 of those people gathered in a hotel ballroom for a five-day training session to become so-called assisters for DC Healthlink, the health exchange that will serve the District of Columbia. "Imagine a consumer named Joe, who takes regular medication for diabetes management, sees a physician several times a year for diabetes management, and at one point in the year he gets into a biking accident," said Elizabeth Kaplan, a staff attorney at Whitman-Walker Health, describing one possible scenario. The bike accident lands the hypothetical Joe in the emergency room. If Joe winds up with roughly $3,000 in annual medical bills, and if he had signed up for a platinum plan, the most generous of those available in the exchange, he won't have to worry much. "He's likely to only pay about $300 of the total cost of his care," Kaplan told the class. "Does that make sense? Any questions about this?" Assister Shari Curtis is one of about 100 people who will help educate people on health exchange options in the district. And so it went, eight hours a day, for five straight days. Clearly helping is not for the faint of heart. Mastering the material wasn't optional. "They take certification tests every day of training, and a cumulative certification test at the end," says Erin Loubier, another senior staff attorney with Whitman-Walker Health, which the city hired to help run the training. Loubier says about half the trainees already knew something about health insurance. They may have been involved in signing up people for public programs like Medicaid. The other half were complete novices. But the assisters all have one thing in common, she says: They're serious about their task. "You can see from the questions that they're really enthusiastic about their role," she says. "They really are trying to make sure they understand it." Deborah Bazemore is one of the trainees who's working hard to be sure she gets things right. She works for Unity Health Care, which provides care to many of the city's uninsured and working poor. Bazemore used to verify insurance coverage at a local rehabilitation hospital. She's looking forward to actually helping people face to face. "Even though they are responsible for making the choice, we can at least show them what's a good plan for the type of care that they need," Bazemore says. These aren't just people hired off the street. They all work for local nonprofit organizations that were chosen by the exchange both for their roots in the community, and for their ability to serve varied populations throughout the city. The district assisters are paid by the organizations they already work for, as are navigators, as they're called in the states. 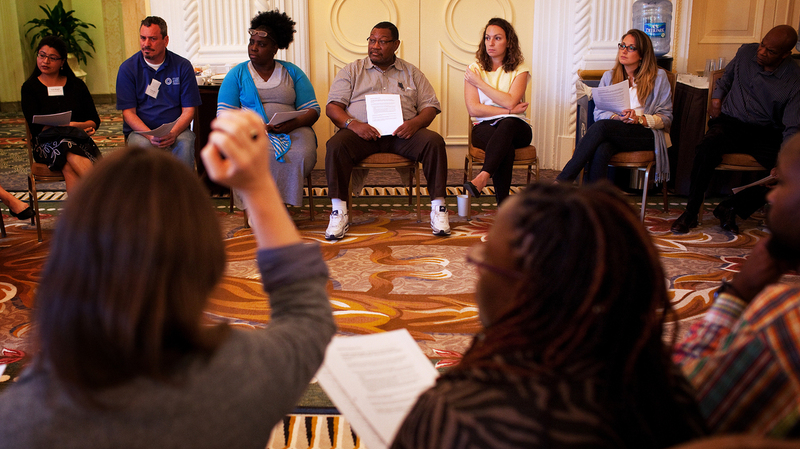 Ethics training is part of the weeklong training for assisters in the district. Quizzes and a final certification test aim to ensure accuracy. "They've got relationships with people that are already established, and they're trusted," says Richard Sorian, the exchange's communications director. "The idea is people will be able to come to them and get all of the help they need, so that they don't wind up either being confused or not getting the insurance that they want." But along with that trust comes verification. Since these people will be getting access to personal information, there are some serious background checks. "They both are fingerprinted and they go through FBI and local screening for any issues that might come up," says Loubier. These assisters won't just be staying in the places they work, however. The D.C. exchange is planning to have them fan out to libraries, community centers and even local pharmacies. They'll also be available for house calls, if people call the exchange hotline to make an appointment. During a lunch break, John Esposito, a 25-year-old assister-in-training said he's really excited about getting going. "I'm ecstatic," he said. "It's great to have a job that actually helps people in a tangible and real way on a one-on-one basis, and helps society as a whole." Like the rest of the health law, the training program has had some glitches. Some organizations around the country actually returned training grants when Republicans in Congress demanded reams of information about how they planned to protect consumers' personal information. And in some areas the training is still underway, even as the exchanges are getting up and running.